December 3, 2018 December 2, 2018 / Elizabeth T.
Happy December! I can’t believe it’s the first official week of the last month of the year! Why is time passing by so fast?! Though I’m sad 2018 is ending (since I haven’t achieved all that I’ve set out to for the year), I’m also super excited for Christmas (because what’s not to love about the season, with its festive music, sparkly decorations, and joyful moments with loved ones)! As it’s nearing winter, LA has actually finally started to cool down, and at night, it can get pretty chilly. On days where I’m feeling extra lazy, it can be so easy to just reach for my trusty hoodies, but at the same time, they can look a little too casual, making it look like I just rolled out of bed. But there are definitely ways to elevate hoodies for a chic look that’s casual enough for an easy day yet sophisticated enough to go out in! 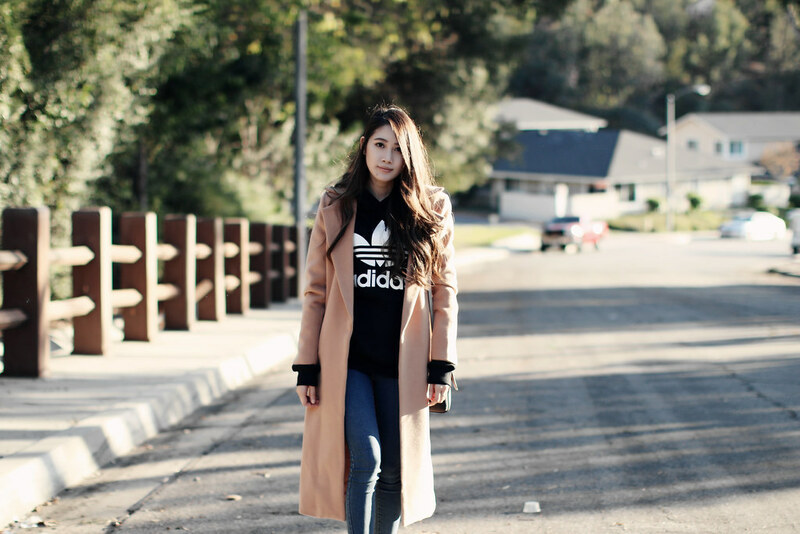 Read on to see how I style my hoodies for an elevated look that’s perfect for the holiday season! Though I have a large collection of hoodies in my wardrobe, on lazy days, I still tend to gravitate towards my branded hoodies, especially ones from sporty brands, as this can play up the “athleisure” vibes of my overall ensemble. As I said before, there’s a fine line between wearing a hoodie fashionably and wearing it casually, so any subtle ways to set your hoodie apart from just one that you sleep in will help to elevate it. Some of my favorite hoodies to wear are my Nike or Adidas ones. And of course, if you have any old hoodies from your alma mater, those definitely work too, as it adds a collegiate feel to your outfit as a whole. Though it may be tempting to opt for joggers or other types of athletic bottoms, remember fashion is all about balance. While sweatshirts and hoodies definitely match leggings and joggers, wearing them together will absolutely make it look like you just literally rolled out of bed. Instead, I usually opt for skinny jeans because they’re the perfect pair of casual bottoms that still look put-together and chic. Another plus – they hug the figure, which can help streamline your entire look, rather than looking frumpy and overshadowed by a bulky and oversized hoodie. And of course, the most integral step in creating a chic outfit with your hoodie that elevates the entire look – there’s no better way to do so than by literally throwing a classier piece of outerwear on top. When you think of fall and winter wardrobes, there’s nothing more classic and timeless than coats because they add the perfect touch of sophistication to just about any ensemble. Of course, another one of the best things about coats and hoodies is that they’re easy to layer, making them super convenient to wear together. And to finish off the entire outfit, I opt for a pair of classic white kicks to add that touch of athleisure back to the ensemble, which matches perfectly with the sporty branded hoodie and gives off a casual, effortless vibe that’s chic yet understated. Are you a fan of hoodies during the colder months? What’re some of your favorite ways to style hoodies or other casual pieces? Let me know in the comments because I always love hearing from all of you! This coat has been my favorite! ❤ 🙂 Thanks love! 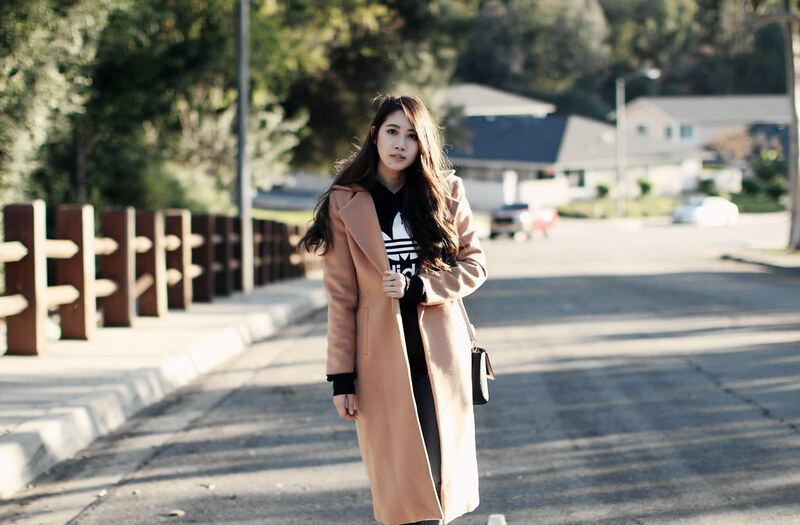 The trench coat definitely elevates the look styled with this hoodie!! Haha I’ve never thought to style an outfit this way but then again LA hardly ever gets cold enough for me to layer these thick clothes. 🙂 Looking lovely for Fall girl. Haha yea, but lately, it’s definitely been cold enough to layer ❤ 🙂 Thanks babe! Love these great tips! You look so chic! In Austria it is already way too cold for this look, unfortunately. Awww hopefully it’ll warm up soon! ❤ 🙂 And I love styling coats and hoodies together! 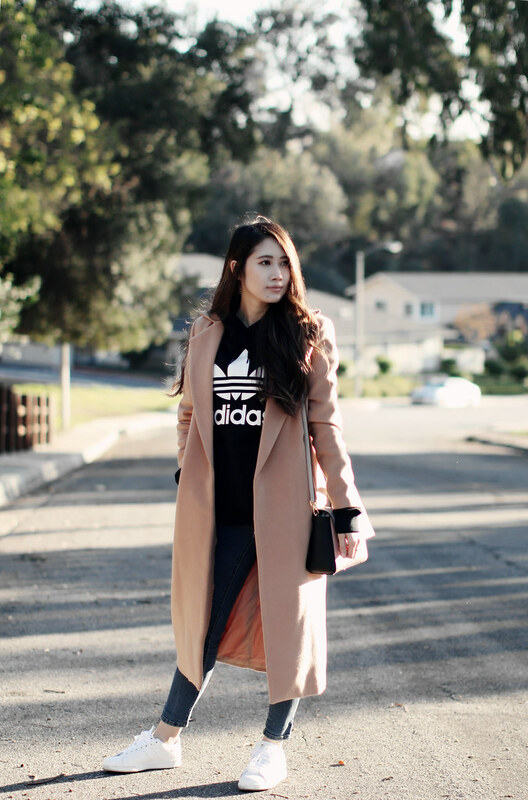 I love this layered winter look! 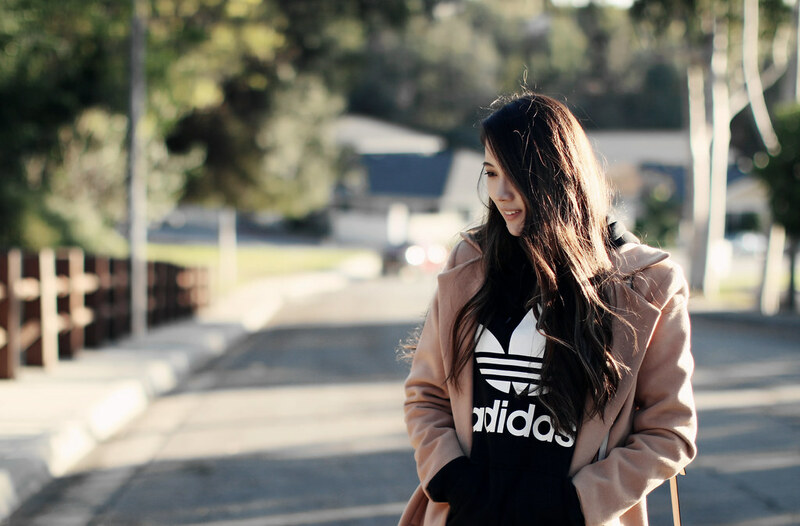 I have the same Adidas hoodie and wear it under jackets all the time. This coat is so pretty too and such a classic. Great casual but chic style! 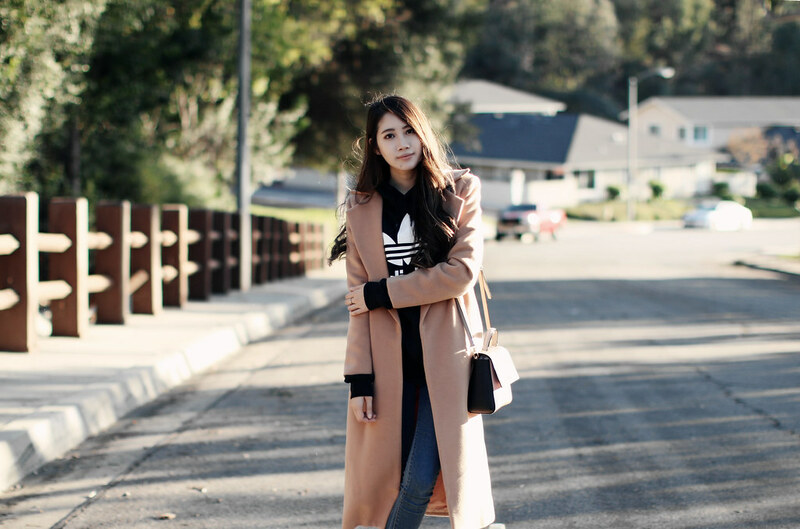 I love the idea of a stylish coat over your hoodie. Looks so great! I always love a good hoodie with anything, but you look super chic girl! Aww you’re too sweet, girl! ❤ Thanks! absolutely love your coat! you look so chic! Loving your warm coat dear!! Lovely outfit. IyIt’s definitely something I’ll wear all day any day. I love the way you styled this! So comfy AND chic! The best combo! Thanks babe ❤ 🙂 It's super cozy to wear! Love how you styled the outfit! I can’t remember the last time I wore a hoodie but you’ve made it look so chic! Hahaha it’s definitely been awhile since I’ve worn a hoodie too, but I’ve been wearing them more lately! ❤ I haven't realized that they could be so chic too! loving your jacket! super chic look! Thanks babe ❤ 🙂 This jacket is my favorite! Yes, this coat is soo cozy yet chic ❤ 🙂 Thanks babe! I love this! 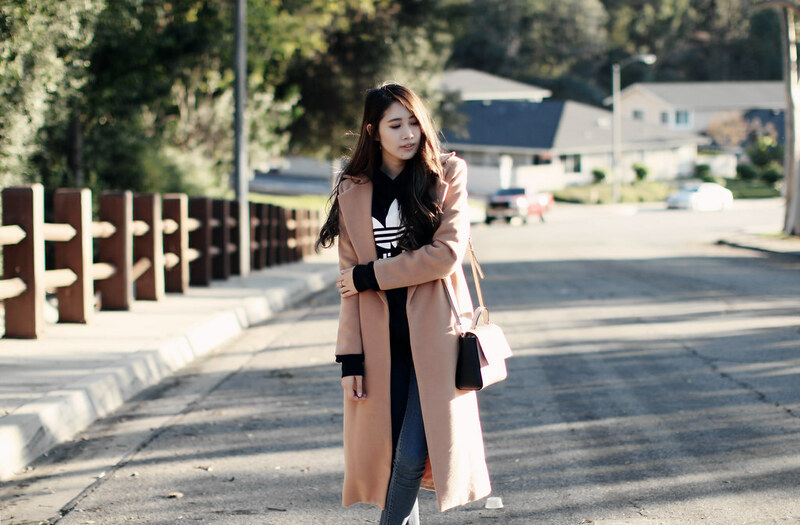 I’m always living in hoodies when it’s cold and it’s amazing to see how it can actually be part of a chic outfit!